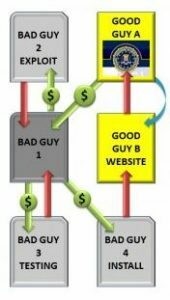 FBI Moneypak is the PUP that uses misleading techniques to prevent removal. Use Reimage to locate malicious components and get rid of them faster than with uninstall instructions. A full system scan blocks virus reappearance and prevents traffic to malicious domains. How people get infected with FBI Moneypak? How can I remove FBI Moneypak? 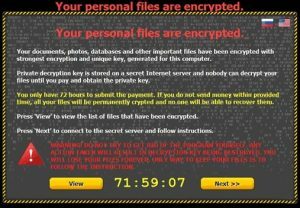 FBI Moneypak (can also be found as FBI virus) is a ransomware infection that clearly shows how the bad guys are skillfully improving their techniques while trying to earn more money. This virus not only displays misleading alert looking like a legitimate notification sent by Federal Bureu of Investigation but also locks the system down so that you can't do anything about it. The main reason why scammers have released such virus is really simple – they expect you to believe that you have been 'illegally watching copyrighted content and now you have to pay a 'fine' through Moneypak service'. Victim is usually asked to go to Wallmart or Wallgreens stores to make a payment (see the image below). Before you go and pay, read the details below to make sure that you have a deal with serious cyber infection. 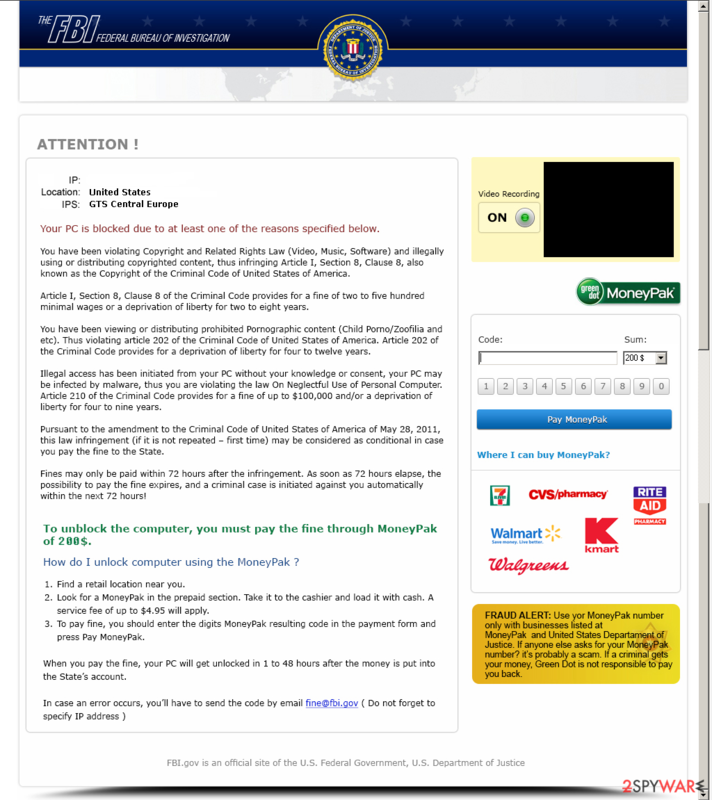 We highly recommend not to fall for FBI Moneypak virus because you will only support the online criminals in this way. 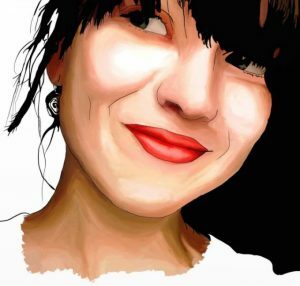 This sophisticated intruder gets inside the system via trojan horses that come inside unnoticed by a user and download all the files needed for FBI Moneypak. In addition, FBI Moneypak locks the system down and displays its pop-up message based on misleading information about copyright and related rights law violation. In fact, it looks almost like a legitimate message displayed by FBI! However, you must keep in mind that this alert is completely deceitful and wants only to mislead you into spending your $100 to unlock the PC. Instead of that, you should don't waste your time and remove FBI Moneypak from your computer before it starts additional activity on your computer. First of all, read how you can avoid getting infected with FBI Moneypak virus: security experts recommend to ignore all the spam letters and never open attachments that can be found inside them. In addition, stop wasting your time with freeware because such programs may also come together with viruses. Finally, always make sure you have reputable anti-virus and anti-spyware programs installed so that they could help you to prevent such viruses like FBI Moneypak. Take another machine and use it to download Malwarebytes MalwarebytesCombo Cleaner, Reimage, Plumbytes Anti-MalwareMalwarebytes Malwarebytes or other reputable anti-malware program. Reboot computer infected with FBI ransomware once more and run a full system scan. 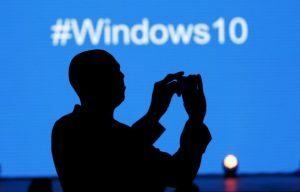 * Users infected with FBI Moneypak/FBI virus/FBI Green Dot Moneypak virus/FBI Virus Black Screen are allowed to access other accounts on their Windows systems. If one of such accounts has administrator rights, you should be capable to launch anti-malware program. Reboot and run a full system scan with updated Reimage to remove remaining FBI Moneypak virus files. This entry was posted on 2014-10-16 at 01:40 and is filed under Ransomware, Viruses. You can quickly scan the QR code with your mobile device and have FBI Moneypak manual removal instructions right in your pocket. How did you remove FBI Moneypak?